"He who has never been burned by the sun," a Turkish proverb has it, "won't know the value of shadow." Ahmet Lokurlu is a case in point. Plagued by painful sunburn acquired during a 1993 vacation on the Turkish riviera, the Turkish-born engineering graduate student fell to wondering whether the intense heat of the celestial body, that most potent of renewable energy sources, could be converted into soothing cold. Back at his university in Essen, Germany, the doctoral candidate began developing the technology to put his idea into practice. Today, the emission-free solar cooling system manufactured by Solitem, the Aachen-based company he founded, is providing climate control for a steadily growing number of hotels and hospitals in the Mediterranean. Once just a tiny research outfit, Solitem now has some 30 employees, production facilities in Turkey and clients and partners all over the world. Lokurlu's invention is particularly suited to southern climes where, he says, air-conditioning is responsible for up to 40% of power consumption. 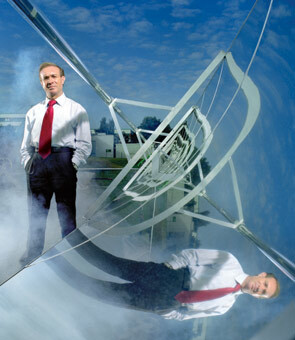 Catching the radiation of the sun with reflective parabolic troughs that are mounted on roofs, Lokurlu's pressurized device produces 356 degrees F (180 degrees C) water that is transformed into steam. The steam powers a special kind of absorption chiller  a refrigeration unit that employs heat instead of electricity as its energy source. The Solitem system is versatile, too: the hot water it produces can also be used to clean laundry or heat swimming pools. No less energetic than in his student days, Lokurlu, 43, is now hoping to develop a low-cost version of his technology. "We want to make it affordable for people in those regions of the world where environmentally friendly cooling devices are needed most, but where there is little money for such purposes," he says. That other companies may try to emulate his spirit of innovation doesn't bother him in the slightest. On the contrary, "there really should be as many Solitems as possible," muses the scientist-entrepreneur, who is currently writing his second Ph.D. thesis. This one is on evolutionary ethics, he says, "so we can help solve the energy and climate problems humankind faces."